Buried deep inside one of the last bills signed into law by President Barack Obama, we find an interesting glimpse into the anti-Russian mania that has gripped Washington since mid-2016. This little-discussed addition to the bureaucracy that exists in the hallowed halls of the Federal Government is the latest addition to helping Main Street America determine the "real truth". As it was first envisioned, the purpose of the GEC was to track terrorist propaganda (particularly ISIL's version) and to work across various government agencies and with other governments to develop a coherent and consistent anti-terrorist message. The GEC was the latest iteration of the State Department's long-standing efforts to coordinate interagency communications countering terrorist messaging and the influence of terrorist organizations that threatened the United States and its global interests. 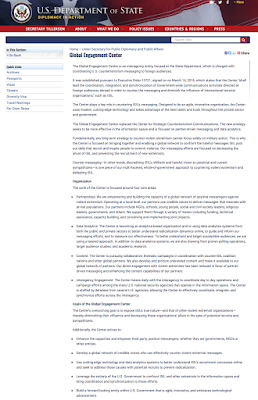 Executive Order 13721 revoked the order that established the Center for Strategic Counterterrorism Communication (CSCC) which was established by Executive Order 13584, also signed by Barack Obama in September 2011. The mandate for the CSCC was directed at "...countering the actions and ideology of al-Qa-ida, its affiliates and adherent and other international terrorist organizations and violent extremists overseas." When al-Qa-ida lost its preeminent position as the world's leading terrorist organization, the Obama Administration moved to slightly alter the mission of its anti-terrorist State Department unit. 1.) Integrate interagency and international efforts to track and evaluate counterfactual narratives abroad that threaten the national security interests of the United States and United States allies and partner nations. 2.) As needed, support the development and dissemination of fact-based narratives and analysis to counter propaganda and disinformation directed at the United States and United States allies and partner nations. 3.) 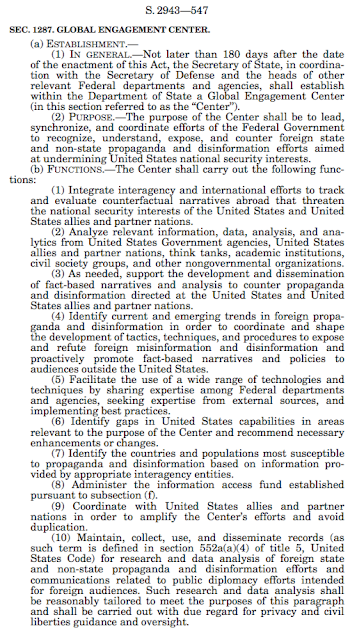 Identify current and emerging trends in foreign propaganda and disinformation in order to coordinate and shape the development of tactics, techniques, and procedures to expose and refute foreign misinformation and disinformation and proactively promote fact-based narratives and policies to audiences outside the United States. 1.) To support local independent media who are best placed to refute foreign disinformation and manipulation in their own communities. 2.) 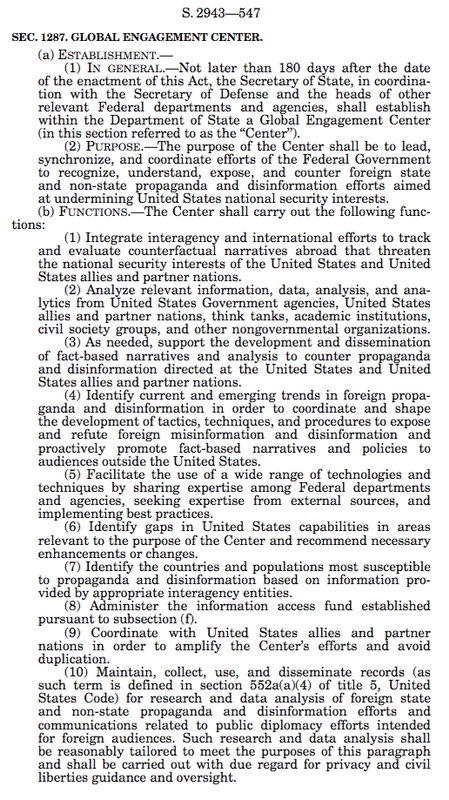 To collect and store examples in print, online, and social media, disinformation, misinformation, and propaganda directed at the United States and its allies and partners. 3.) 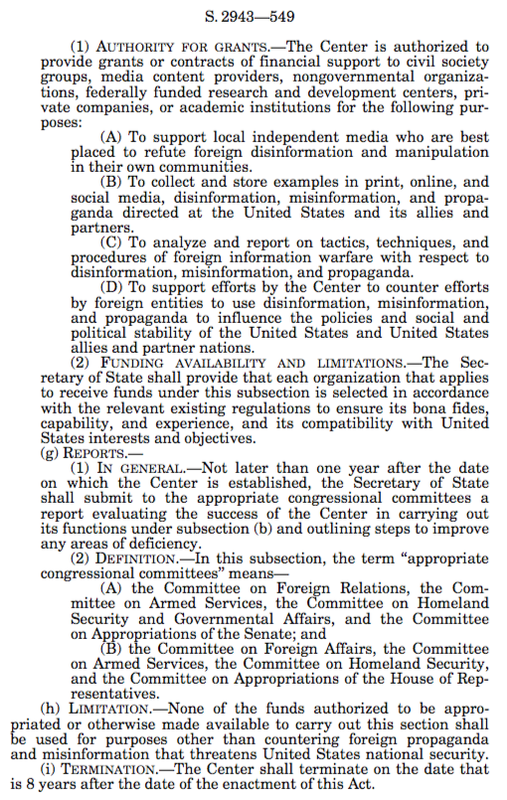 To analyze and report on tactics, techniques, and procedures of foreign information warfare with respect to disinformation, misinformation, and propaganda. 4.) 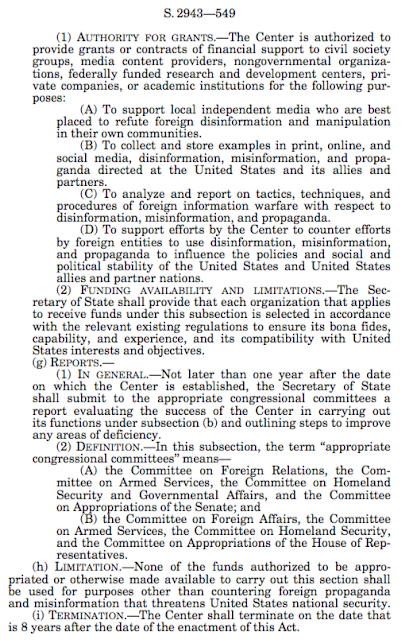 To support efforts by the Center to counter efforts by foreign entities to use disinformation, misinformation, and propaganda to influence the policies and social and political stability of the United States and United States allies and partner nations. Basically, the GECr is allowed to fund organizations that will be able to counter state-based (i.e. Russia and China) and non-stated based propaganda with more propaganda, the big difference being that it will be the "right kind" of propaganda. As you can see, the functions of the Global Engagement Center morphed significantly from March 2016 to December 2016, becoming a state-based propaganda/anti-propaganda tool of Washington rather than a tool that was originally designed to counter international terrorism for the global good. 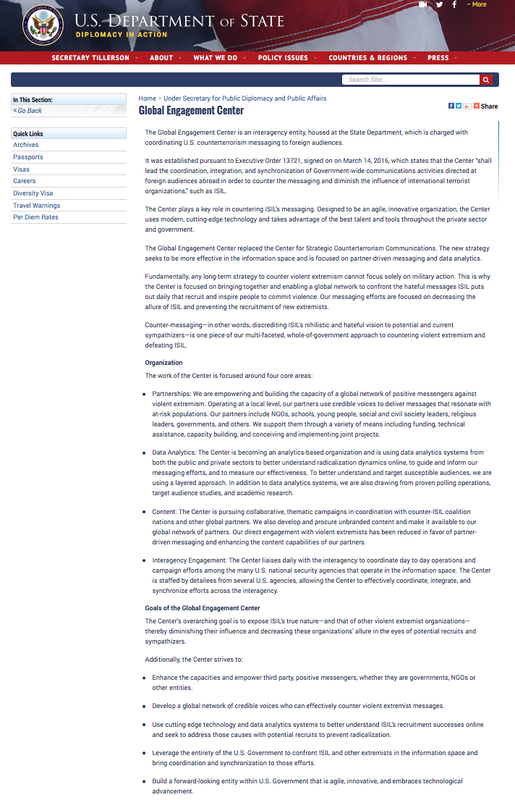 Keeping in mind that the Global Engagement Center was originally designed to be an arm of the Department of State, it is interesting to find that such a significant change in its mandate is nestled deeply within the pages of a bill that authorizes the spending of $611.2 billion for the Department of Defense, its Overseas Contingency Operations and the national security programs of the Department of Energy. In case you were curious, for fiscal 2015, the CSCC had a budget of approximately $6 million. This grew to $16 million in fiscal 2016 when the CSCC was replaced with the GEC. 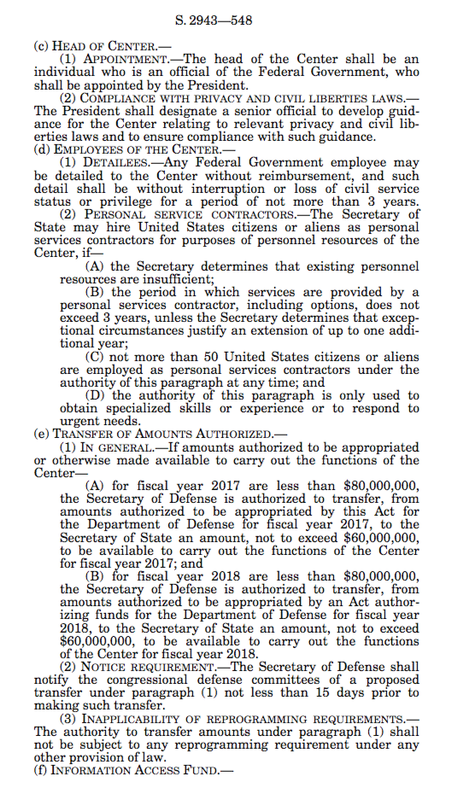 Under the most recent iterations in Section 1287, the Secretary of Defense is authorized to transfer up to $60 million in each of fiscal 2017 and 2018 if the GEC receives less than $80 million in direct funding in both fiscal years. As well, the GEC has a lifespan of 8 years after the Act is signed into law. 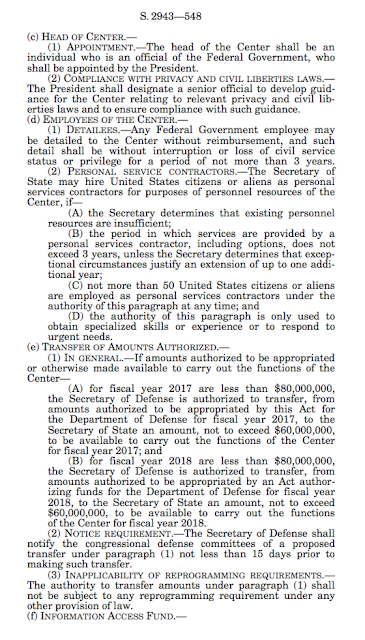 While this is but a tiny fraction of the overall $611.2 billion authorized in S.2943, it is interesting to see how, in light of the so-called "Russian election meddling scandal of 2016", the budget for the Global Engagement Center has risen in lock step with its expanded mandate to help the global village decide what is Russian propaganda and what is the "real truth". And, as an aside, now that you know what the Global Engagement Center is up to, doesn't it have a rather Orwellian sounding name?